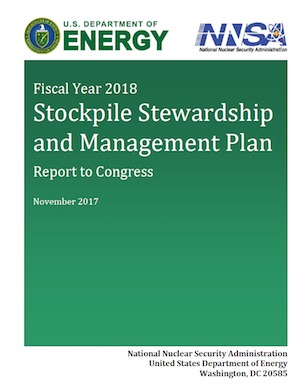 The National Nuclear Security Administration (NNSA) has published its long-awaited Stockpile Stewardship and Management Plan (SSMP) for Fiscal Year 2018. The SSMP is NNSA’s 25-year strategic program of record. I’ll leave it to others to analyze the infrastructure and fissile material portions and focus on the nuclear weapons life-extension programs (LEPs) and cost estimates. This year’s plan shows complex LEPs that are making progress but also getting more expensive (some even with funding gaps). There are some surprises (the retirement of the B61-10 tactical bomb), some sloppiness (the stockpile table has not been updated), and some questionable depictions (how to cut stockpile in half with no effect on average warhead age). Nonetheless, the SSMP is a unique and important document and a service to the public discussion about the scope and management of the nuclear weapons arsenal and infrastructure. NNSA deserves credit for producing and publishing the SSMP. As such, it is a reminder that other nuclear-armed states should also publish factual overviews of their nuclear weapons programs to enable fact-based discussions and counter unsubstantiated rumors and worst-case suspicion. The 2017 SSMP does not update the nuclear stockpile number but continues to use the 4,018-warhead number (as of September 2016) declassified by the Obama administration in January 2017. The Trump administration has yet to declassify any nuclear stockpile numbers. The number now is estimated at around 4,000. The report includes a graph that shows the average warhead age in the stockpile over the years. The graph shows the age continued to increase until about 2009, at which point it slowed until leveling out in 2014, presumably because of the significant production of W76-1 warheads (an LEP resets the warhead age to zero). In 2016, the average age began to drop, presumably because of the Obama administration’s 500-warhead cut in 2016 and continued production of the W76-1. NNSA’s average warhead graph shows no effect from W Bush administration’s massive nuclear stockpile reduction. Click to view full size. For that to be true, NNSA would have had to retire precisely the same portion of newer and older warheads of each warhead type, which seems odd. The report reveals that the B61-10 tactical bomb was quietly retired in September 2016. The B61-10 has been in the inactive stockpile since 2006. The retirement is a surprise because the B61-10 is one of four B61 versions NNSA has listed to be consolidated into the B61-12. Once the B61-12 was produced and certified, so the argument was, the older versions would be retired. The 2017 SSMP reveals that the B61-10 tactical bombs has been retired but continues to list the weapon as part of the B61-12 “consolidation” plan. 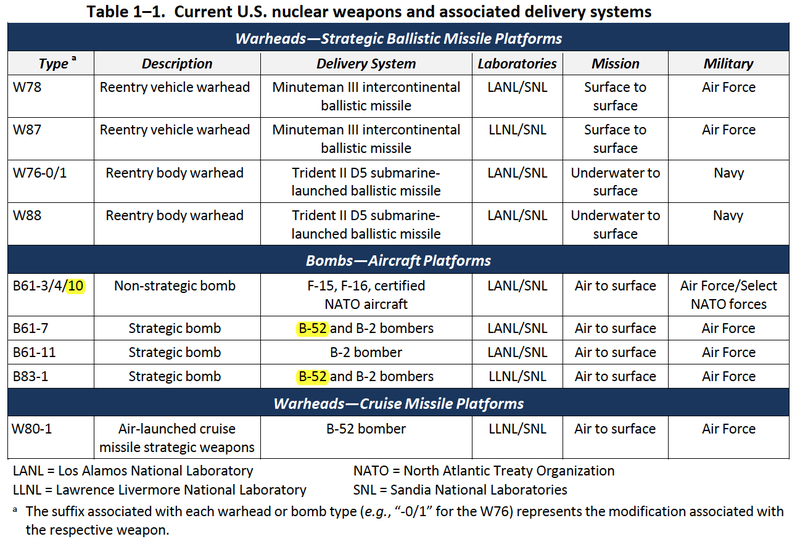 Despite the B61-10 retirement, the SSMP’s main table of the current nuclear weapons and associated delivery vehicles still lists the bomb (another table in the report does not list the B61-10). The SSMP report’s main table for the arsenal lists the B61-10 even though it has been retired, and gravity bombs for the B-52H even though it no longer caries them. That table also lists the B-52H as carrying gravity bombs, even though other government documents no longer list gravity bombs assigned to the bomber. The authors appear to have done a sloppy job and simply copied the table from the 2016 SSMP without updating it. W76-1 LEP: Complete production in 2019. With production of the W76-1/Mk4A having reached 80% and scheduled completion in 2019, Joint Flight Tests for the W76-0 has now stopped. That means it is official out of the stockpile and that all W76 war reserve warhead are now of the new W76-1 design. W87: Gas Transfer System (GTS) field refurbishment appears to have slipped halfway through 2019 with completion in 2024 instead of 2023. B61-12 LEP: First production unit in March 2020. Because program is moving ahead, the Nuclear Weapons Council in 2016 agreed to reduce surveillance tests for the B83 and B61-3, -, -7, and -10 bombs (the -10 has been retired). W88 Alt 370: First production unit December 2019. Cost estimate has increased by 11 percent since 2015. W80-4 LEP: First production unit in 2025. Will use IHE of W80-1 but with new surety features. Unique program risks due to parallel integration with LRSO missile. 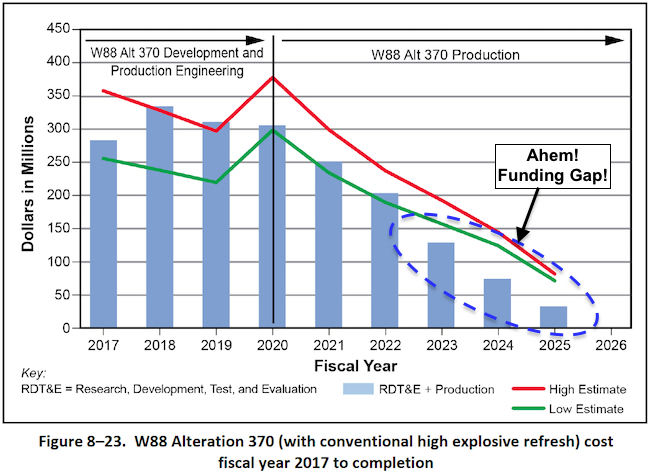 IW1 (W78/W88): Studies and engineering to begin in 2020 and production to run from 2031 to 2041, a bit shorter than depicted in the 2016 SSMP. Will use W87 pit. ICBM first production unit in 2030 for use in Mk21 RV. SLBM first production unit in 2032 for use in Mk5 RB. PF-4 facility at Los Alamos in August 2016 “fabricated a W87 pit as part of the planned development series,” but next War Reserve pit is not scheduled until 2023. IW2 (W87/W88): ICBM first production unit in 2035. SLBM first production unit in 2036. IW3 (W76-1): ICBM first production unit in 2041. SLBM first production unit in 2042. 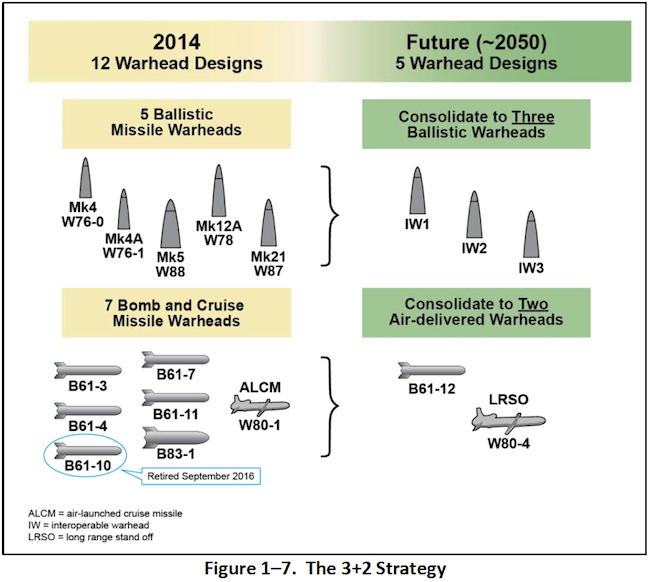 But even though “[f]inal designs of NEPs for the IW1, IW2, and IW3 warheads are yet to be determined,” the SSMP nonetheless confidently declares that the “3+2 Strategy preserves confidence in the stockpile’s operational reliability and effectiveness, while mitigating risk and uncertainty.” IW1 production is not expected until 2031, and I bet there are a couple of more design evaluations and decisions before NNSA can make any realistic assessment about reliability and effectiveness. Moreover, I hear a lot of grumbling in the Navy and Air Force with concerns about introducing significantly modified warhead designs when the existing versions work just fine. Indeed, because the IW designs have not been tested in the assembled configuration envisioned, the 3+2 plan could introduce new uncertainties into the stockpile about warhead reliability and performance. The Nuclear Posture Review is considering modifying a SLBM warhead to primary-only configuration to enable rapid low-yield strikes with ballistic missiles. NNSA’s nuclear weapons budget has increased by 60 percent since 2010, and the agency is hoping for another $1 billion increase in 2018. In anticipation of the new NPR, the 2017 SSMP does not include budget numbers for 2019-2022 (the 2016 SSMP included these out-year numbers). And the detailed cost graph cuts off after 2018, unlike the 2016 SSMP graph that continued through 2021. 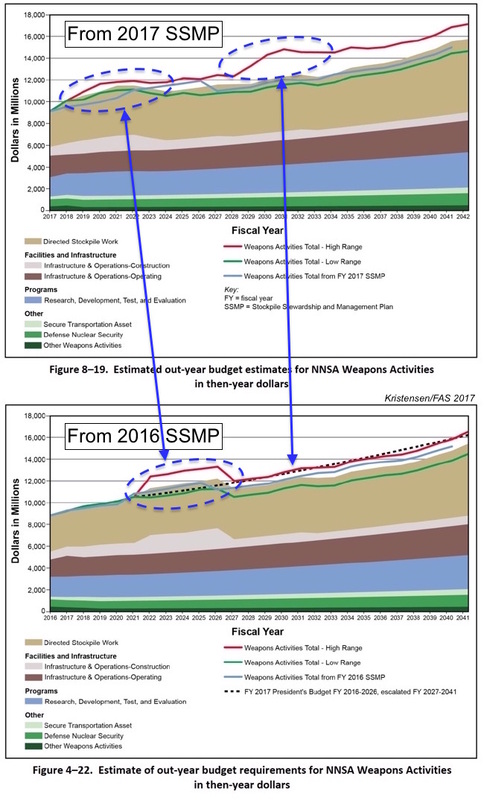 But NNSA provides a new graph that plots expected weapons activities costs through 2042; there are significant changes compared with the graph included in the 2016 SSMP. NNSA has restructure LEP spending plan so it moves “bow wave” up earlier, creates new bow wave later, and increases overall long-term costs. 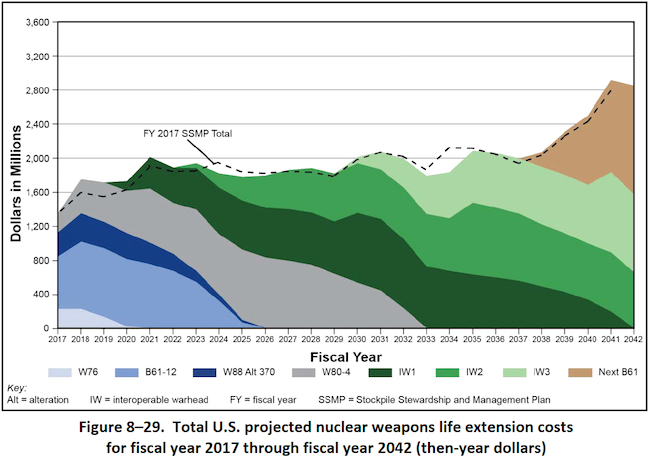 It will take more time to analyze the data but a first impression is that NNSA has reorganized the projected costs so that the bow wave shown in the 2016 SSMP to appear in the 2020s now has been spread out and moved up so that it begins almost immediately and ends in the mid-2020s. Moreover, the graph shows a new high-range estimate cost emerging in the late-2020s and with significantly higher projections through 2042. As part of that projection, all of NNSA’s LEPs high-end cost estimates appear to have increased, and there are still funding gaps toward the end of some of the programs, a budgeting problem that has previously been pointed out by GAO. Some LEP programs appear to have insufficient funding. And if you think the $10 billion B61-12 program is expensive, just check out the high-end cost estimate for the next B61 LEP (known as B61-13): a whopping $13.7 billion to $26.3 billion. Combined, in NNSA’s illustration, all the LEPs add up to $1.4 billion in 2017, increasing to nearly $2 billion per year in 2021-2037, and then ballooning to more than $2.8 billion per year by 2041. With $2 billion multi-LEP costs annually, another even more expensive B61 LEP looms on the horizon. The 2017 SSMP also includes some interesting information about the production complex capacity, not least the planned production of plutonium pits at Los Alamos National Laboratory. Production is scheduled to increase from four pits in 2018 to 10 in 2024, 20 in 2025, 30 in 2026, and build capacity to produce 50-80 pits per year by 2030. Later in the SSMP (p. A-10), it turns out the requirement for the 10, 20, and 30 pits in 2024, 2025, and 2026, respectively, actually is to produce “not less than” those numbers. And the requirement for 2030 is no less than 80 pits. All of this of course hinges on if and how NNSA can complete the construction of the expensive production facilities needed. The 2017 SSMP concludes that “there is no current requirement to conduct an underground nuclear test to maintain certification of any nuclear warhead.” That is good news. The 1993 Presidential Decision Directive (PDD-15, “Stockpile Stewardship”) directed NNSA to maintain the capability to conduct a nuclear test within 24 to 36 months, just in case a test was needed in the future. This reassessment of the test readiness requirement appears to erode the US commitment to the testing moratorium. And it implies that NNSA is anticipating that future and more complex LEPs might potentially require “a simple test” with a nuclear yield. Such a test would be devastating to the international security environment and trigger a wave of nuclear tests in other nuclear-armed states. For now, warhead development and surveillance rely on subcritical hydrodynamic tests, which are gradually becoming more complex and using more fissile material. The 2017 SSMP describes work is underway to develop an operational “enhanced capability” for subcritical experiments by the mid 2020s. There were seven “integrated hydrodynamic experiments” conducted in 2016, including for what the SSMP describes as “stockpile options.” These options appear to be different from the known LEPs and stockpile maintenance efforts. “Maximum” is a dangerous requirement because it can be used to justify pursuit of all sorts of enhancements for the sake of improved capability. “Sufficient” is a much better word because it forces planners to think about how much is enough and balance this against other realities and requirements. The Trump administration’s Nuclear Posture Review expected at the turn of the year will mainly be focused on implementing the main elements of the Obama administration’s nuclear modernization program, but it is also considering new weapons and modified warheads. And the tone describing the international environment will certainly darken. In describing the strategic context, the 2017 SSMP unfortunately makes the usual mistake of lumping Russia in among the countries that are “expanding” their nuclear arsenals. In terms of the total number of launchers and warheads, that is not the case. NNSA’s nuclear warhead modernization plan forms part of a boarder nuclear modernization plan that is unaffordable as currently designed. The Congressional Budget Office recently presented options for how to reduce the costs. Several of those options include scaling back or canceling warhead programs, options that NNSA should actively consider. Modifying requirements and scaling back ambitions can have considerable effects on what the Nation gets in return for its investments. Consider for example that the complex $10 billion B61-12 LEP only adds 20 years of life for 480 warheads, while the simpler $4 billion W76-1 LEP adds 30 years of life for 1,600 warheads. The early retirement of the B61-10, moreover, raises obvious questions about why some of the other “consolidation” versions (B61-3, -4, and -7) cannot also be retired early. Moreover, many B83s currently maintained in the stockpile could probably be retired early as well and dismantled. On dismantlement, the 2017 SSMP is a clear step back. The requirement in the 2016 SSMP to accelerate dismantlement of warheads retired prior to 2009 has been deleted from the 2017 update. And while funding for dismantlement in the 2016 SSMP was increased to two percent of the directed stockpile budget, the 2017 report reduces the budget for warhead dismantlement and disposition to only one percent. Completion of dismantlement of warheads retired prior to 2009 is scheduled for September 2022 – one year later than the deadline listed in the 2016 SSMP. But the 2017 SSMP doesn’t even address what the plan is for dismantling the backlog of the roughly 1,000 warheads that have been retired after 2009. While dismantlement is not a priority for NNSA or defense planners who are focused on modernization, it is an important and powerful message to the international community that the United States is not only modernizing but actually also scrapping nuclear weapons. After all, with no new arms control treaty to replace New START (not even negotiations), an INF treaty that is close to collapsing, rejection of the Ban Treaty, and rampant modernization programs underway to extend the nuclear era through the rest of this century, what else do we (and the other P5s) have to show at the nuclear Nonproliferation Treaty review conference in 2020? 1 – Where does it say that LEPs reset warhead age to zero? There are many components that are reused in a life extension. Possibly the most important component (the pit) hasn’t been manufactured in any meaningful way since Rocky Flats closed in 1992 (ref pit production plan Table 2-3, page 2-30). 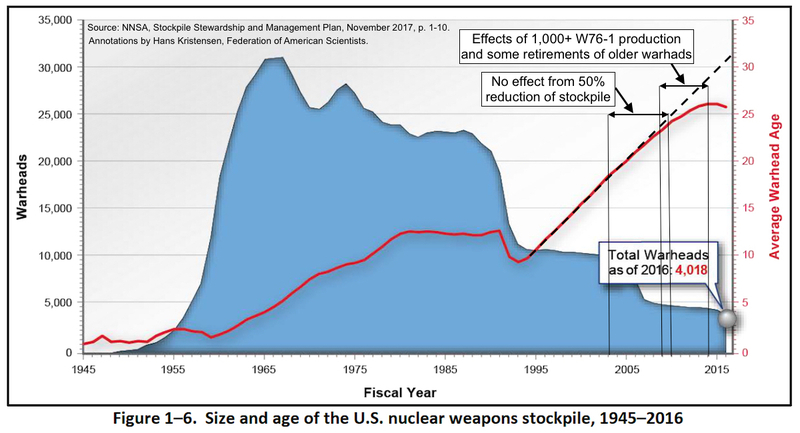 Without that age reset, the stockpile average should increase linearly unless (like you said) you’re retiring the oldest warheads first. 2 – If the B61-10 is retired, then NNSA is not necessarily retiring the oldest warheads first. I’m guessing the downturn in average age is due to a combination of retirements of the B53 in 1997 and W62 in 2010. 1. The SSMP doesn’t say the LEPs reset warhead to zero, but officials have told me so many times. Even component reuse involves refurbishment and re-certification for another 20-30 years. The point of the LEP is to zero the clock. 2. Correct. There were not many B53s but lots of W62s. Many B83s have been retired. The W84 has been retired. The W80-0 was retired and has already been scrapped even through it was retired after 2009. Many W76-0s have been retired. 1. The document doesn’t say that but officials do. That’s the whole point of an LEP: to reset the clock and give the weapon another life-cycle of 20-30 years. 2. Warhead age is less straightforward than it may seem. Which gets to continue and which gets to retire is not simply a matter of when it was produced but also how well that particular design is aging. The Mod 10 had been in the inactive stockpile since 2005. It was a converted W85 Pershing warhead, which in turn was based on the B61-4, which is still in the stockpile.